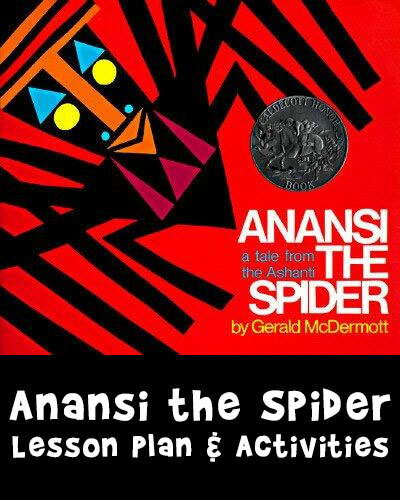 Anansi the Spider: a tale from the Ashanti people of Ghana, a country in West Africa, is a folktale written down and illustrated by Gerald McDermott. 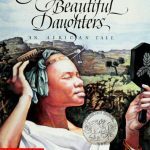 In this African myth, Anansi, who is a mischievous folk hero and trickster, must determine which of his sons is worthy enough to become the keeper of a precious gift. It is a story, passed down from generation to generation in the oral tradition, and like most myths it has changed over time. McDermott’s adaptation is one of beauty, and his illustrations use traditional patterns of the Ashanti people. 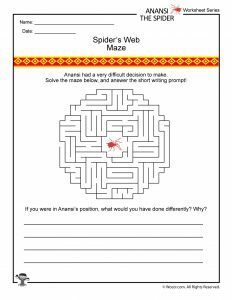 Below are some activities and worksheets to go along with this beautiful picture book to help you create an Anansi the Spider lesson plan. Culture (n) – The ideas, customs, and social behavior of a particular people or society. Falcon (n) – A bird of prey with long pointed wings and a notched beak, typically catching prey by diving on it from above. 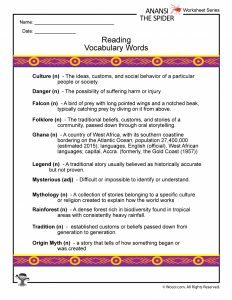 Folklore (n) – The traditional beliefs, customs, and stories of a community, passed down through oral storytelling. 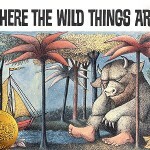 Legend (n) – A traditional story usually believed as historically accurate but not proven. Mysterious (adj) – Difficult or impossible to identify or understand. Rainforest (n) – A dense forest rich in biodiversity found in tropical areas with consistently heavy rainfall. Tradition (n) – established customs or beliefs passed down from generation to generation. 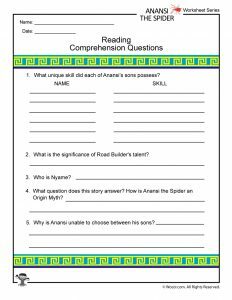 What unique skill did each of Anansi’s sons possess? What is the significance of Road Builder’s talent? 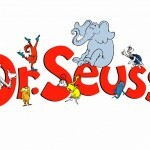 What question does this story answer? 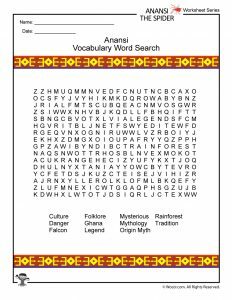 How is Anansi the Spider an Origin Myth? 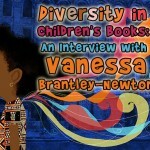 Why his Anansi unable to choose between his sons? 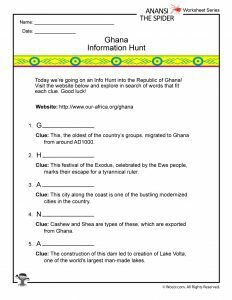 Send your children on an Info Hunt of the Republic of Ghana by exploring the website below in search of things that fit each clue. In a classroom, students can work in pairs/groups. Waakye, a creative dish of beans and rice, is very popular for breakfast in the city of Acca. It originates in Northern Ghana where beans and rice are staples. Similar dishes are found in many cultures of the African diaspora, or communities resulting from the cultural infusion created by the transatlantic slave trade. Waakye is usually served with a thick tomato-based stew made with goat or cow meat, talia (spaghetti), fried plantains, boiled eggs, avocado and a salad. It is a filling meal! The illustrations in Anansi the Spider mimic the rich Batik patterns favorite amongst the textile industry in Ghana. Watch this video about the traditional art of Fabric Dyeing and then, make your own. Bees Wax (available in bulk from Mountain Rose Herbs) OR Elmer’s Glue if you are doing this with younger children. Tjanting Needles (if using wax). If using glue, you can use a paintbrush or craft sticks. Wax melting station (if using): melt beeswax over a double boiler and keep on low, so it does not cool too fast. Drawing station: should be a safe distance from the melting station and should have a flat surface on which you can work. wax removal stations: a Large bucket of boiling water in which you can submerge your fabric to melt and remove the wax. Draw your design on your fabric or tee with the pencil. Or, if you prefer a more abstract design, fold your fabric into geometric shapes (rectangle, square, triangles). Paint areas of your design and or shape with wax using the Tjanting Needles, carefully. You can do several coats of the wax. Allow the wax to harden a bit. With the paintbrushes or by dipping the fabric into the dye, add your colors. The wax will prevent the color from coloring those areas. Apply as many colors as you wish and paint as many coats as you would like. You can allow the layers to dry between applications too. If you are using wax, boil your fabric to remove the wax and to set the dye. OR spread fabric between two pieces of newspaper and iron until the paper has absorbed the wax. You will have to iron this multiple times. If you are using Glue, peel the dried glue off of the fabric. Boil fabric to set colors. Ghanaian Cedi is the only legal tender in Ghana. 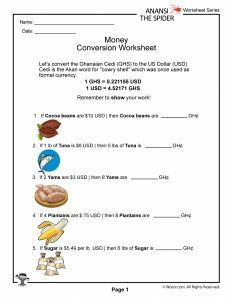 Let’s convert the Ghanaian Cedi (GHS) to the US Dollar (USD). 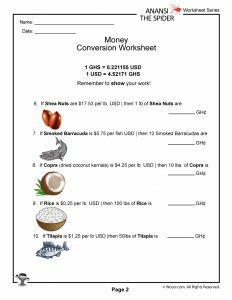 Cedi is the Akan word for “cowry shell” which was once used as formal currency.